Getting the right information to the right people at the right time so they can make the right decisions. 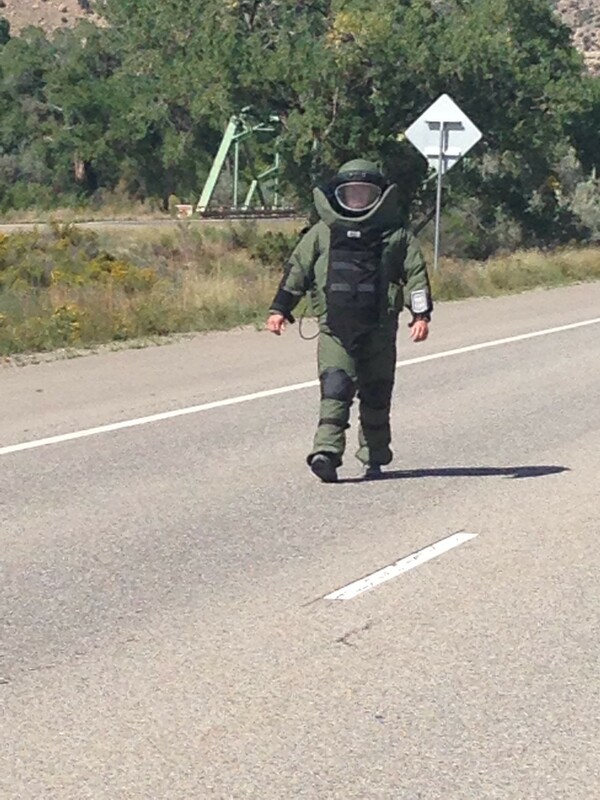 The Grand Junction Police Department Bomb Squad was able to open the suspicious item using render safe techniques so bomb technicians could see inside. After examining it, the bomb technicians determined it was not an explosive device, and instead was likely a piece of equipment used by workers in the energy industry. Thank you for your patience as the emergency personnel worked to ensure the safety of those driving through this area. Previously released information can be found here. Below are several images of one of the bomb technicians investigating the item. Both the eastbound and westbound lanes of I-70 near DeBeque are open again following the investigation of the suspicious item near DeBeque. 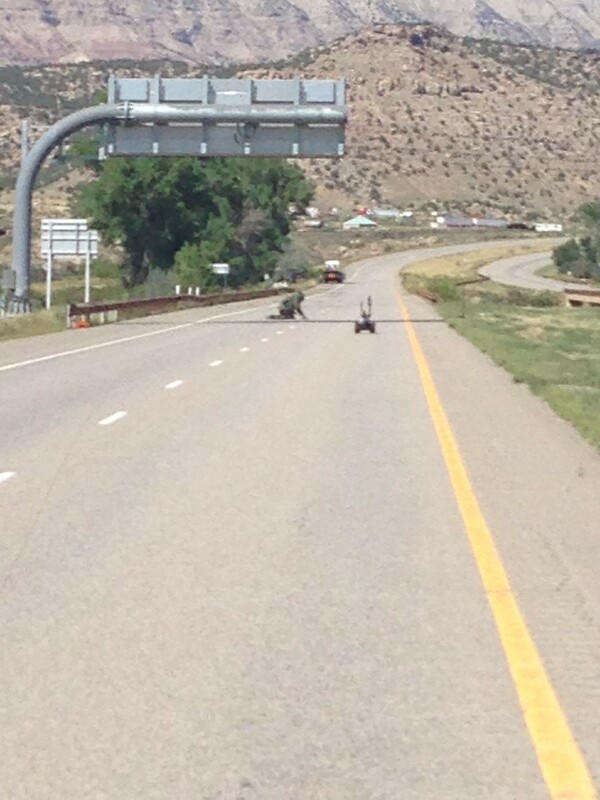 At approximately 11:30 this morning Colorado Department of Transportation crews were picking up trash for their Adopt a Highway program when they noticed a suspicious item on the bridge that goes over the Colorado River just east of DeBeque (approximately mile marker 62.8). The CDOT crew notified the Colorado State Patrol, which then requested the closure of I-70 in both directions as a safety precaution while they investigated. CSP also requested assistance from the Grand Junction Police Department Bomb Squad, which arrived on scene a short time later. 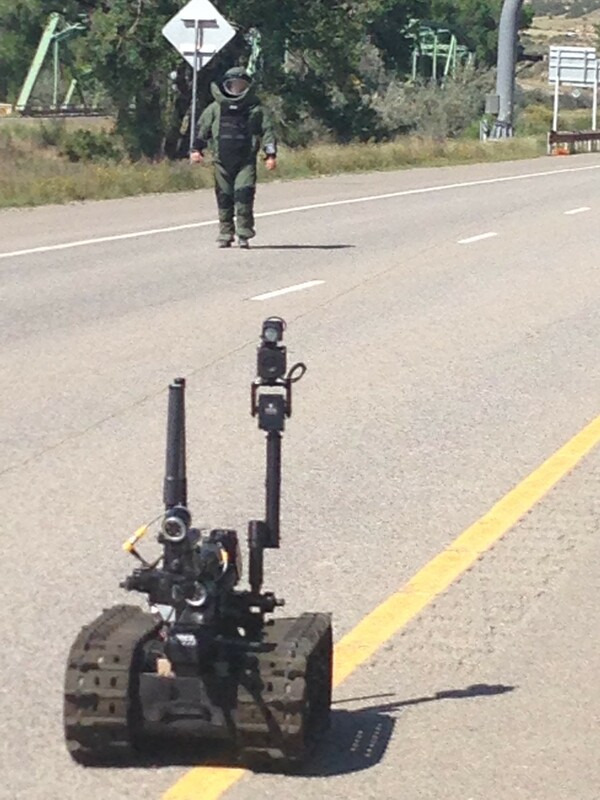 The bomb squad began investigating, utilizing a robot and other equipment. At approximately 3:15pm they were able to render the item safe. This allowed the eastbound lanes of I-70 to reopen. The westbound lanes remain closed for further investigation, but they are expected to open momentarily. We will continue to update this blog with additional information. To be notified of future updates, enter your email address in the space at the right of the screen.